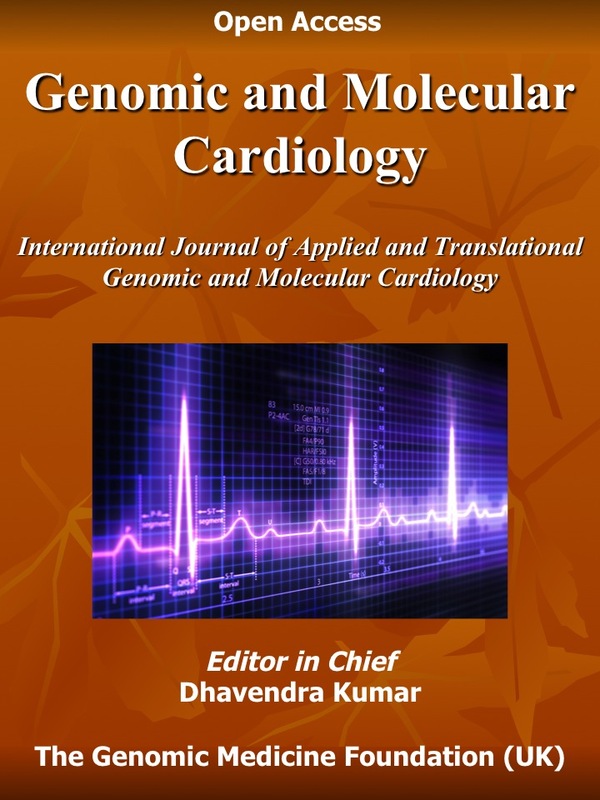 Advances in genomics and other OMICS led science and technology fields are rapidly applied and translated in a number of life sciences and biotechnology fields. It is no longer confined to the research laboratories domain. Massive investments from both private, governmental and non-governmental organizations are poured into genomics for harvesting gains of this highly lucrative and exciting field. In the field of medicine and healthcare alone there are many promising developments emerging that could have immense potential to transform the current and future practice of Medicine and Healthcare. In addition, advances and continued new developments in genome sciences and technologies are likely to make a huge impact on plant, crop and live stock farming, pharmaceutical industry, bio-technological industries and new bio-energy resources. It is predicted that genomic developments could have major socio-economic implications at nationally and globally. Education and training at grass root level and on continued development basis are undoubtedly crucial for the successful and productive applications of any science or technology field. Genomics is no exception and in fact requires a more thoughtful approach for education and training in basic and applied aspects of this field. This is important for less developed and developing countries with limited infrastructure and financial resources. Most current education and training programs are research based built up on conventional science and technology courses. However, during the last 5 years, many Institutions and Universities have set up several new graduate and Masters level courses. Most of these courses happen to be offered and targeted on students from developed nations in the West. Few organizations catering the needs of students and young scientists from less developed and developing countries have limited programs on genetic and genomic education and training. Most of these are for guidance only and do not have any sustainable framework. Independent movements, like the Indo UK Genetic Education Forum, have developed a network of likeminded scientists, clinicians and healthcare professionals targeting only the Indian subcontinent. Similar efforts are led by other organizations like the Latin America Human Genetics Society, the South Africa Human Genetics Society and the Asia Pacific Human Genetics Society. 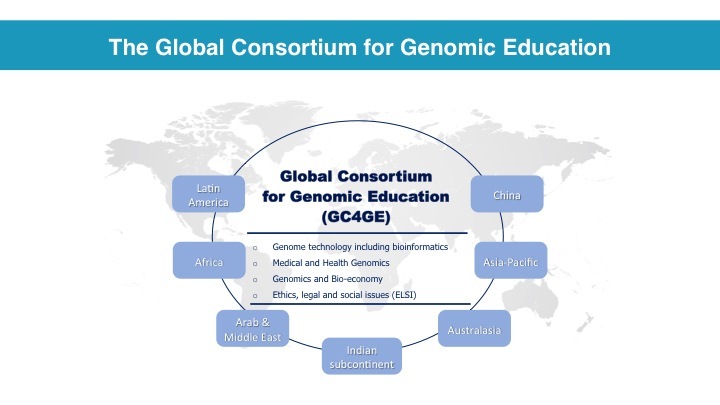 The Global Consortium for Genomic Education (GC4GE) is a major new initiative to bring together many committed scientists, clinicians, professionals, institutions, laboratories and organizations for developing a concerted program for genomic education and training delivered globally with a particular focus on developing and less developed nations. To identify and engage with major Professionals, Institutions and Organizations involved with genetic/genomic education and training. To develop the core framework for the consortium in collaboration with participating groups. To develop a network for the consortium working on the ‘hub and spoke’ model. To develop the bespoke integrated genomic education and training program incorporating major components of genome science and technology. To develop mechanisms for delivering the integrated genomic education program on regional and country basis. The proposed consortium (GC4GE) is planned on the ‘hub and spoke’ model. The central hub, hosted by the Genomic Medicine Foundation (UK) Ltd., will coordinate and manage the functioning of the Consortium. Each spoke of the GC4GE will represent a particular region or country, for example Asia Pacific region will be one unit since it includes many small countries compared to India or China. These regions and countries are selected from less developed and developing nations category. Experience and the knowledge base from the developed nations hub will be used for developing the curriculum and assembling the faculty. The faculty will work jointly with respective regional and country faculty for developing bespoke program and assessing the outcomes. High caliber experts will be convened to join the advisory and executive teams. The education and training program of each main sector will include seminars, series of webinars and training workshops. The individual educational activity will be appropriately tailored for accreditation by the relevant regional and/or national authority. It is also envisaged that the educational program might also be approved for accumulated credits or affiliated with existing or new academic courses, such as Diploma or MSc in Genomic Medicine offered by many Institutions and Universities. It is anticipated that the above programs will harness highly motivated and academically bright students for further higher studies in genome science and technology including PhD level research projects. Success of the proposed genomic education and training consortium depends on the support and participation of major international stakeholders and the network of participating regional and/or Institutions and Organizations. The proposed consortium will be self-financed. The central hub will be administered and managed by the Genomic Medicine Foundation (UK) through locally raised funds and appointed auditors. Respective organizations and regional/country groups will be responsible for raising funds and managing all educational activities. It is anticipated that there will be active cross-organizational links for maximizing efficiency and effectiveness of available funds and resources, specifically the judicious use of experts and the faculty. The Genomic Medicine Foundation (UK) Ltd. will administer and manage the proposed consortium from its base in South Wales, UK. Two main committees will be responsible for drafting the strategy and planning various educational and training activities. The CEC will include representatives from major stakeholders. The Chairperson of the Genomic Medicine Foundation (UK) shall lead this committee. The membership of the CEC will be limited to 7 including the Chair. This important committee shall include representatives from participating institutions and organizations. In addition, one third of the membership will be drawn from membership of the consortium. At this stage the IAAC membership is limited to 15 including the Chair. The members will elect the Chair by simple majority vote. The consortium shall hold its annual meeting(s) at one of the major stakeholders’ annual conference, for example the annual Human Genome Meeting of HUGO or the Biennial Conference of the Human Variome Project held in UNESCO, Paris. The annual report and proceedings and outcomes of all educational seminars and workshops will be published in the ‘Current Trends in Genomic Medicine’, the official journal of the Genomic Medicine Foundation (UK).